The 20% Bentonite beads and the 30% powder Bentonite beads were tested using the same procedure that was used on the 10% Bentonite beads. Jamie tested the collected samples of the 10% Bentonite and Activated Carbon columns using UV VIS. Her procedure for these tests can be found here. The test results for the 20% Bentonite beads make sense, as this column should exhibit higher absorption (and thus more MG rinses) than the 10% Bentonite beads column. 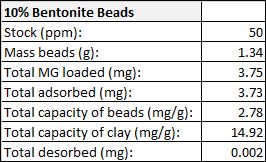 The test results for the 30% Bentonite powder beads do not make sense. This column exhibited the lowest adsorption out of all the Bentonite column, when it should have exhibited the highest. 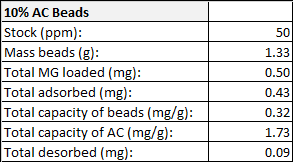 We hypothesized that these test results may be the result of our use of powdered Bentonite in the synthesis of the 30% Bentonite beads, as opposed to Bentonite in solution. In order to test our hypothesis, we planned to synthesize and test 30% Bentonite beads made from a Bentonite solution. It is also important to take into account the effect of flow rate on the absorption of the column.